Pigs are both good companion animals and animals that can be raised and bred for food. Whatever an owner's purpose for having a pig, a nose ring for the animal can be a helpful tool. Clever and tenacious, pigs are hearty animals that need a little human intervention to be controlled. The nose rings pigs wear are used to do just that. Nose rings are put on pigs to control a behavior called "rooting." That is when a pig uses its strong snout to dig around in the dirt as he looks for food or other underground substances that interest him. Pigs root quickly and can destroy large areas of land in no time. They can also end up removing protective barriers by rooting near the edges of their enclosures and uprooting fence posts. 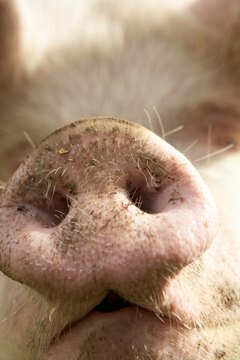 If a pig tries to root while wearing a nose ring, the ring will push against her skin and cause discomfort -- thus encouraging the pig to stop rooting. While rooting with a nose ring is painful in tough ground, the nose ring does allow the pig to root freely in loosely-packed piles of vegetation. Putting a ring in a pig's nose is a two-person job. One person restrains the pig by catching it in a hog shoot and holds the pig's head steady. A second person uses nose ring pliers to position the ring on the top of the nose on the outside, then squeezes quickly to put the ring in place. The ring does not go through the cartilage that separates the nostrils. It is best, however, to have a pig ringed by a veterinarian. Are Pig Nose Rings Humane? There is debate among owners as to the humanity and necessity of pig nose rings. Some say that since pig nose rings create discomfort, they should not be used at all. Others say the discomfort is minimal and the pig soon learns to avoid the associated pain.